This weekend, 16 college and six club teams converged in Wichita Falls, Texas for the Southwest Regional Championship to compete for eight college and three club bids. Texas State University and Lone Star Quidditch Club finished the weekend as Southwest Regional Champions, with both teams ultimately receiving their gold medals via forfeit. How did, arguably, the most prestigious regional titles in quidditch end up allocated based on forfeits in the finals? Let’s discuss. From the start of the week through Saturday morning, Wichita Falls was pummeled by rain, resulting in grass field conditions that would have quickly deteriorated if played on. In order to avoid cancelling scheduled games, as happened at this season’s Northeast and South Regional Championships, USQ was able to find nearby turf fields to play on. Unfortunately, they were only able to find space for two pitches for the majority of Saturday and three pitches for Sunday. Because of these field limitations–,in addition to an hour rain delay to kick things off–the tournament ran far behind the originally planned schedule on Saturday. Luckily, due to pitches being located so closely together and a significant amount of USQ staff on-hand, logistical delays for the tournament wound up being relatively minor. The college championship bracket on Sunday was set up in a double-elimination format for the top four seeded teams, with the second-seeded teams from each pool going straight into the loser’s bracket. In the first games of bracket, Texas State pulled off a close win (120*-100) against University of Texas, and Texas A&M University managed to beat UTSA 120*-40 after the latter suffered a number of player losses due to injury and other obligations day two. 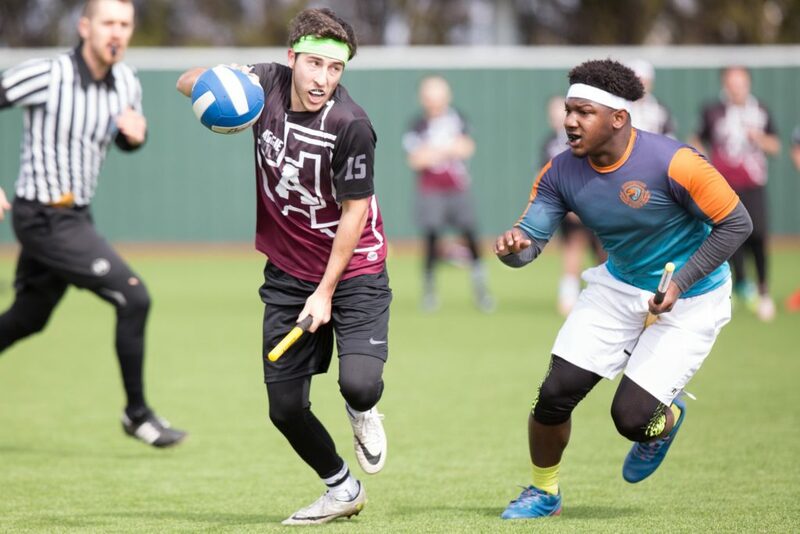 The first semifinal started close, but ended in a rout once snitch came on pitch and Texas State pulled away to defeat Texas A&M 240*-110. This relegated Texas A&M to the secondary bracket, where they faced Texas in the second semifinal after UTSA forfeited their match to Texas due to low roster numbers. Texas A&M went on to defeat Texas 100*-80, but then forfeited the final to Texas State, leaving Texas State the collegiate regional champion after playing just two games Sunday. Texas A&M’s forfeit was based on the fact that their university’s strict club sports policies required them to return by midnight on Sunday, and tournament delays meant that one (or two) more finals matches would have kept them out past curfew. 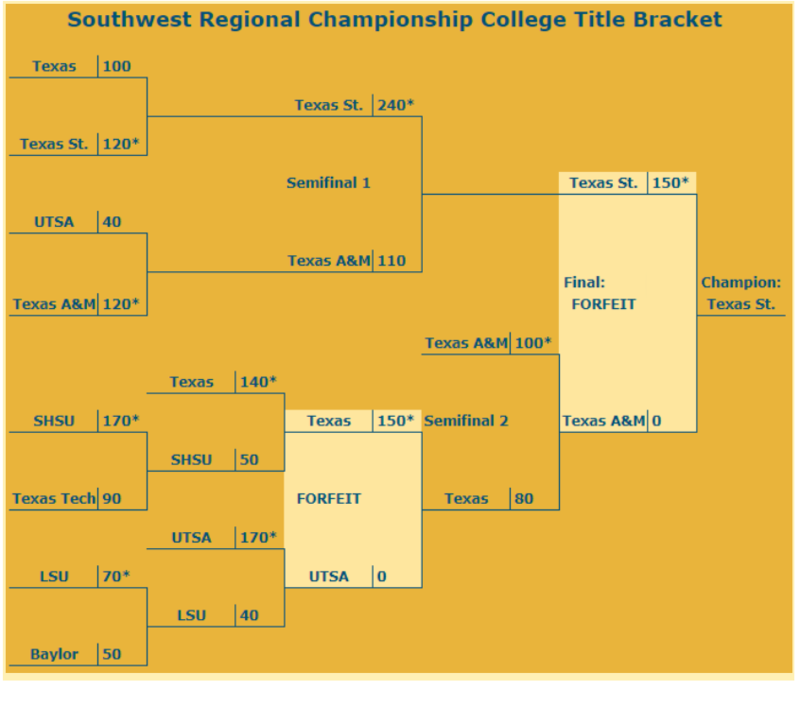 Texas A&M and UTSA’s forfeits were the highest-level forfeits in a Southwest Regional bracket since Texas State forfeited their 2014 quarterfinal match to Texas A&M. Because these forfeits occurred at a regional championship, they will both be recorded as 150*-0 losses in USQ standings. Collegiate bids in order of qualification went to: Texas State, UTSA, Texas A&M, Texas, Sam Houston, LSU, Texas Tech University and the Silver Phoenix. Currently, Baylor University and Oklahoma State University appear to be likely contenders for an at-large bid; however, since Baylor currently sits below the game requirement for an at-large bid, the team would need to play in at least four games against at least two new opponents in order to qualify. The club side of the championship featured six teams playing in a full round robin, with the first and second team going to a best of three series (round-robin game included) to play for the championship title, and the third and fourth team going to another best of three series for the third bid. The 290 Bluebonnets were able to secure the third bid against Bad and Rougie Quidditch Club in two out-of-range wins, despite a Valkyrie upset of the Bluebonnets resulting in the third and fourth place game being decided on tiebreakers. Unsurprisingly, Lone Star and Texas Cavalry ended up the two highest-seeded club teams, with Cavalry going undefeated in round-robin play after a 160*-150 victory against Lone Star Saturday evening.This result meant that Cavalry only needed to win just one of Sunday’s two games against Lone Star to win the regional title, the first for most Texas alumni on the team. However, Cavalry came into day two without their first and second string women beaters, lost to schedule conflicts and injury, respectively. After Lone Star defeated Cavalry 160*-120, both teams agreed to a simultaneous forfeit of the third game so they could get on the road early and avoid further injuries before Nationals. Both teams were aware that this would result in Lone Star winning the championship title on tiebreakers, and each agreed to take a 150*-0 loss in the final. Bad and Rougie, while entering the weekend in contention for an at large bid, now seems likely to be pushed out of contention after going 2-4 with all four losses out-of-range. This would mean it is likely the only Southwest club team representatives at Nationals will be Lone Star, Cavalry and Bluebonnets.